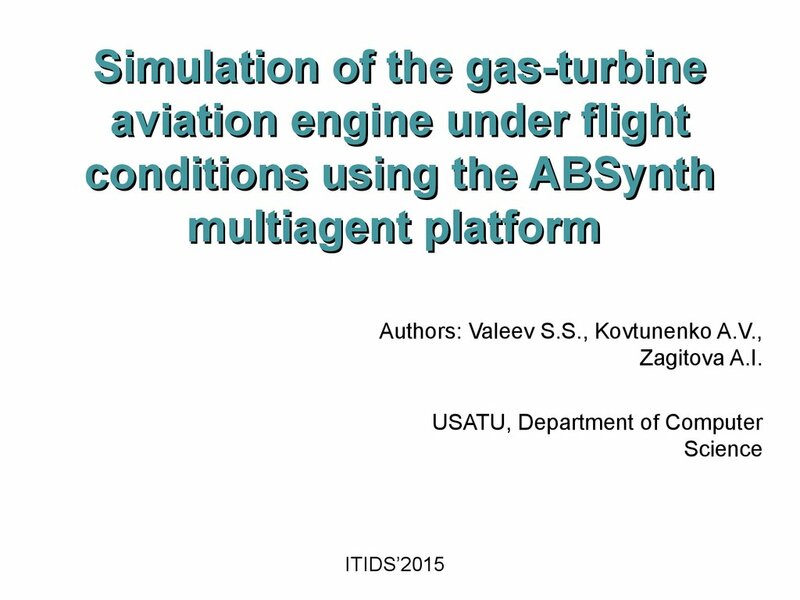 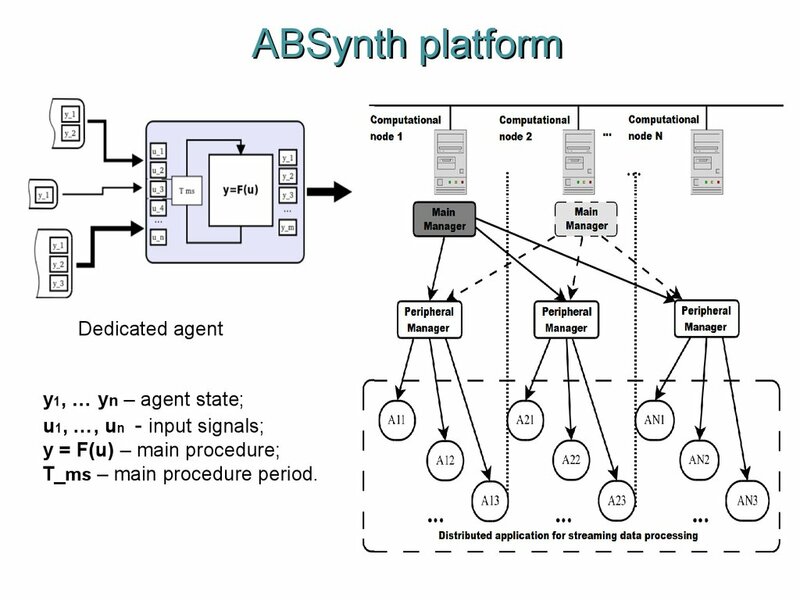 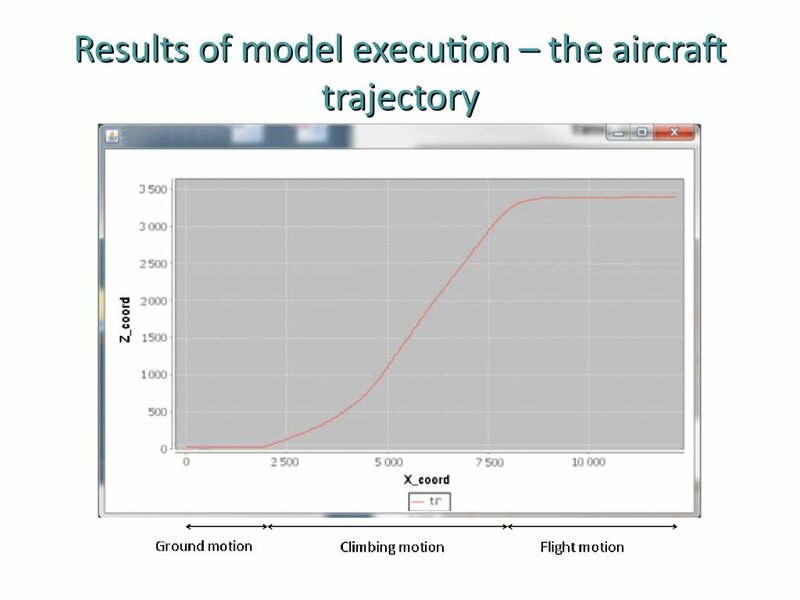 Simulation of the gas-turbine aviation engine under flight conditions using the ABSynth multiagent platform Authors: Valeev S.S., Kovtunenko A.V., Zagitova A.I. 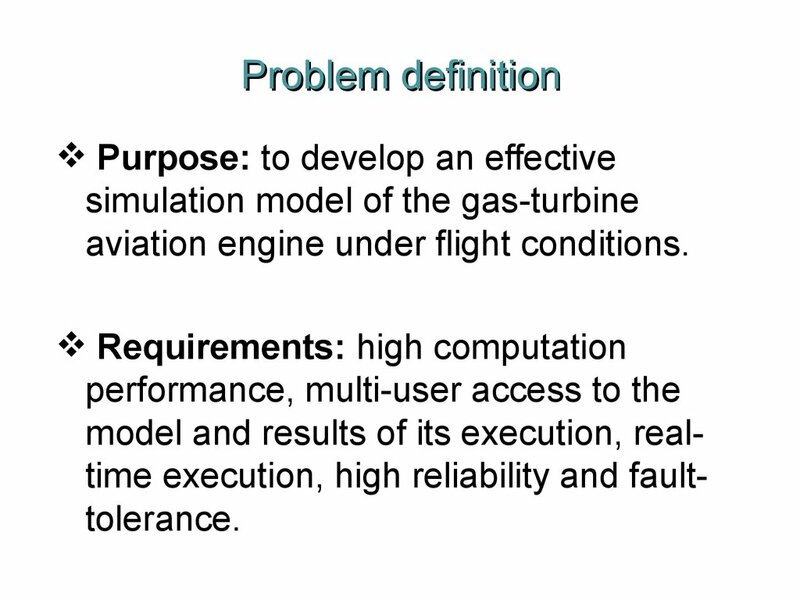 USATU, Department of Computer Science ITIDS’2015 Problem definition Purpose: to develop an effective simulation model of the gas-turbine aviation engine under flight conditions. 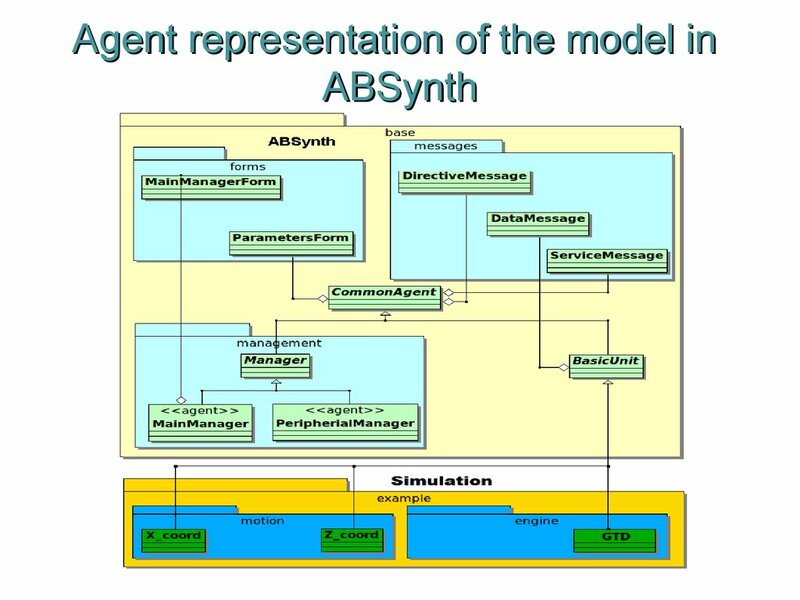 Requirements: high computation performance, multi-user access to the model and results of its execution, real- time execution, high reliability and fault- tolerance. 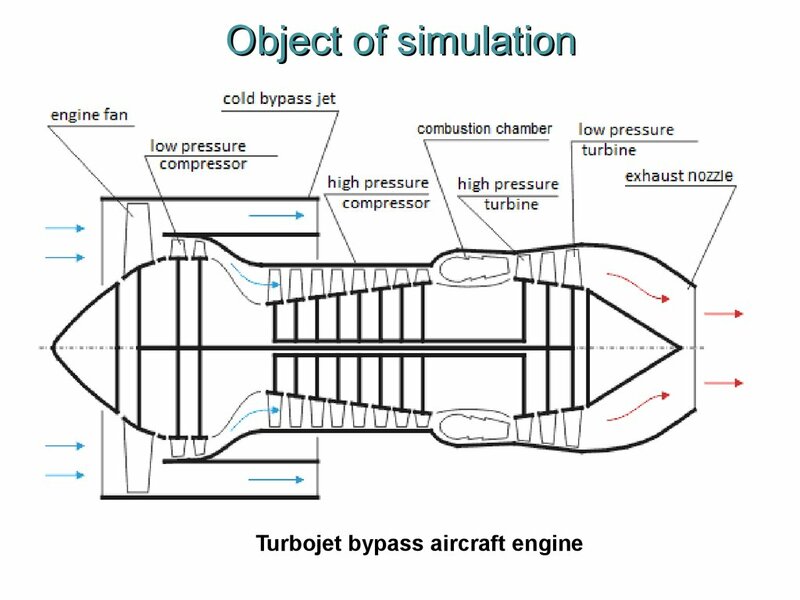 Object of simulation Turbojet bypass aircraft engine Mathematical model of the aircraft engineNHPT – high pressure turbine power;NLPT – low pressure turbine power;NHPS – high pressure spool power;NLPS – low pressure spool power;ηHPT - high pressure turbine efciency;ηLPT - low pressure turbine efciency;IHPR – high pressure rotor inertia;ILPR – low pressure rotor inertia;GEN – gas ow through the exhaust nozzle critical section;Gaf – air ow through low pressure spool;wG – exhaust jet gas velocity;wFS – ight speed. 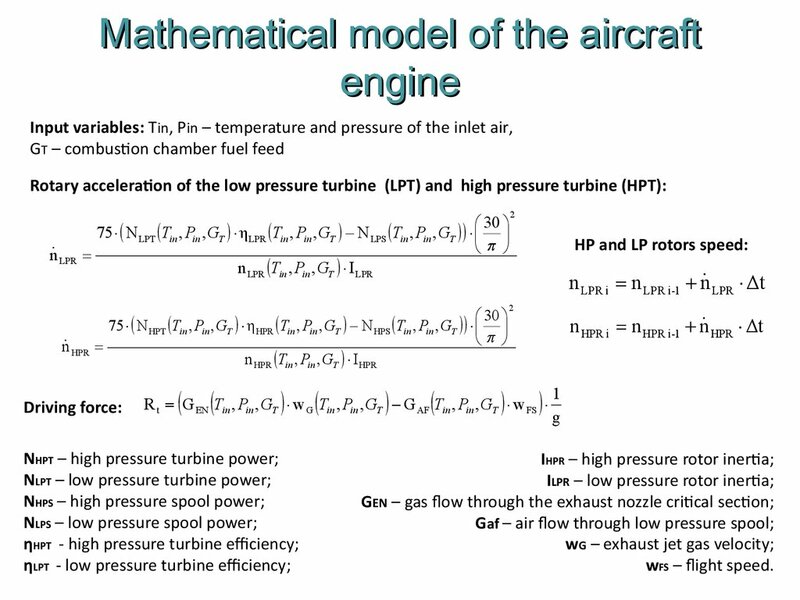 Rotary acceleration of the low pressure turbine (LPT) and high pressure turbine (HPT): HP and LP rotors speed: Driving force: Input variables: Тin , Рin – temperature and pressure o the inlet air,GT – combustion chamber uel eed  LPR2LPSLPRLPTLPRI,n30,N,η,N75nTinTinTinTinGPTGPTGPTGPT  HPR2HPSHPRHPTHPRI,n30,N,η,N75nTinTinTinTinGPTGPTGPTGPTtΔnHPR1-iHPRiHPR  g1w,G,w,GRFSAFGENtTinTinTinGPTGPTGPTtΔnLPR1-iLPRiLPR Mathematical model of flight conditionsMg – gravity;Fa – ascensional orce;Fres – air rontal resistance orce;Frf – rolling riction orce;Fsf – static riction orce;N – support reaction orce;Rt – driving orce. 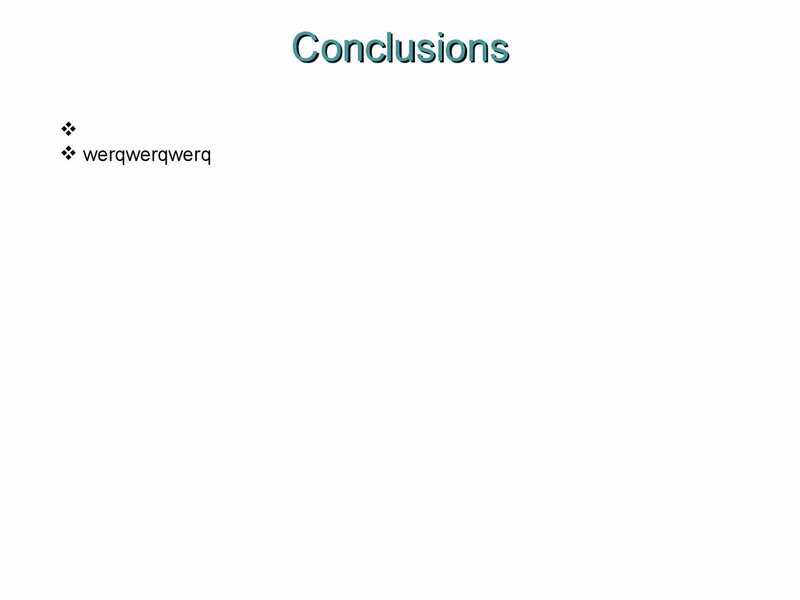 Quiescence : Rt ≤ Fsf;,0,0,0,0,0,0zxzxzx Ground motion (z = 0, Mg ≥ Fa):;,0,0,0,)()(2zMMgKRхКKxrftresarf Flight (Mg ≤Fa):.,)(,)(2MMgхKzMхKRxarest Parallel and Distributed Technologies MPI (Message Passing Interface): + portability, + high performance efficiency;- works well only for the fine-grained parallelism,- requires special skills for programming. 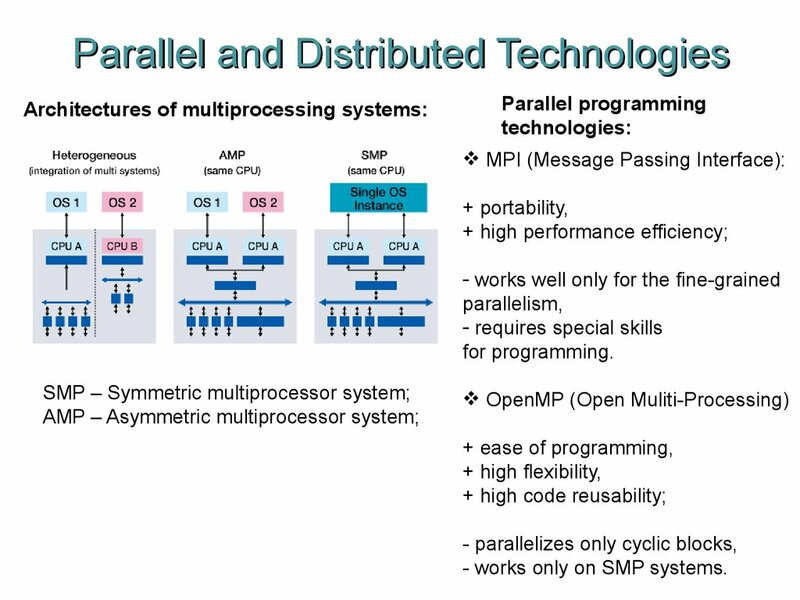 - parallelizes only cyclic blocks, - works only on SMP systems. 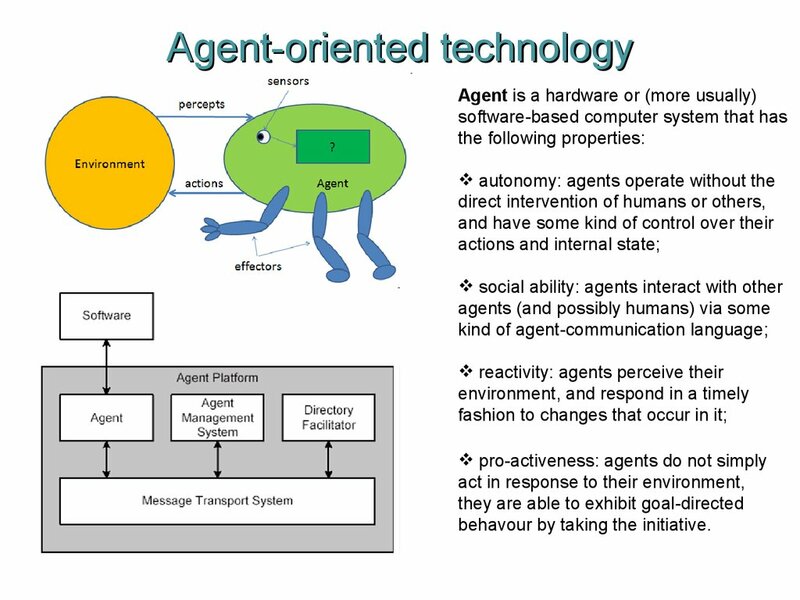 pro-activeness: agents do not simply act in response to their environment, they are able to exhibit goal-directed behavour by taking the initiative. 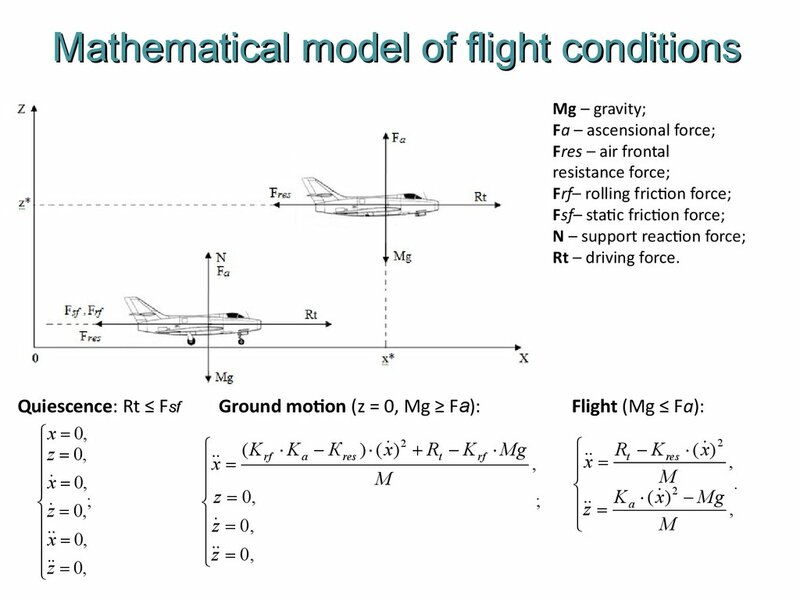 y = F(u) – main procedure;T_ms – main procedure period. 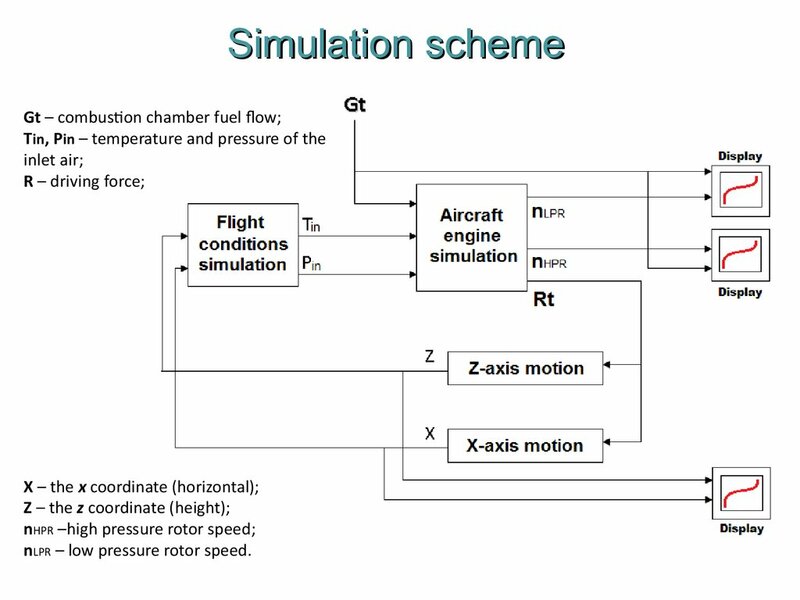 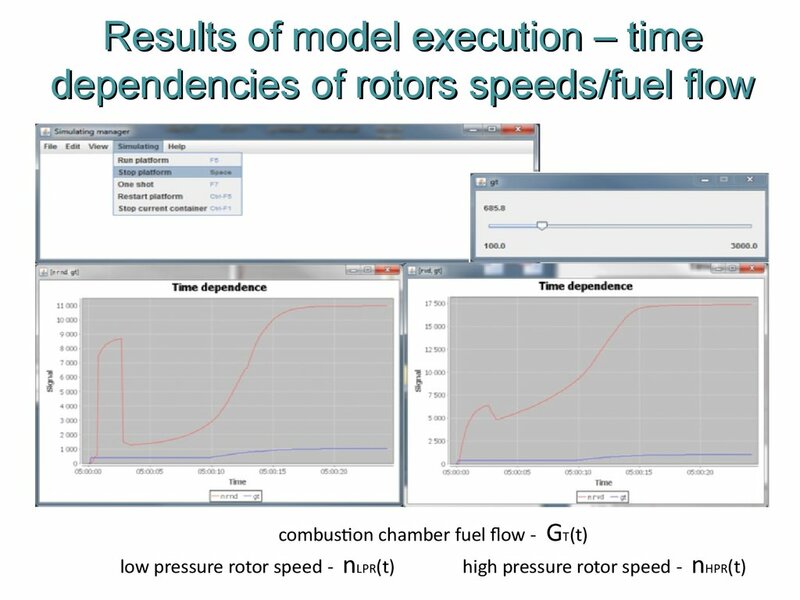 Simulation schemeGt – combustion chamber uel ow;Tin , Рin – temperature and pressure o the inlet air;R – driving orce;X – the x coordinate (horizontal);Z – thez coordinate (height);nHPR –high pressure rotor speed;nLPR – low pressure rotor speed.